Hero Arts | My Monthly Hero August Blog Hop. Whimsical Fairy Card. Giveaway! Hello all and thank you for stopping by today to help celebrate the launch of August My Monthly Hero Kit from Hero Arts (more about the kit and blog hop below). If you are a fan of Shakespeare and whimsical images, this is a perfect kit for you. 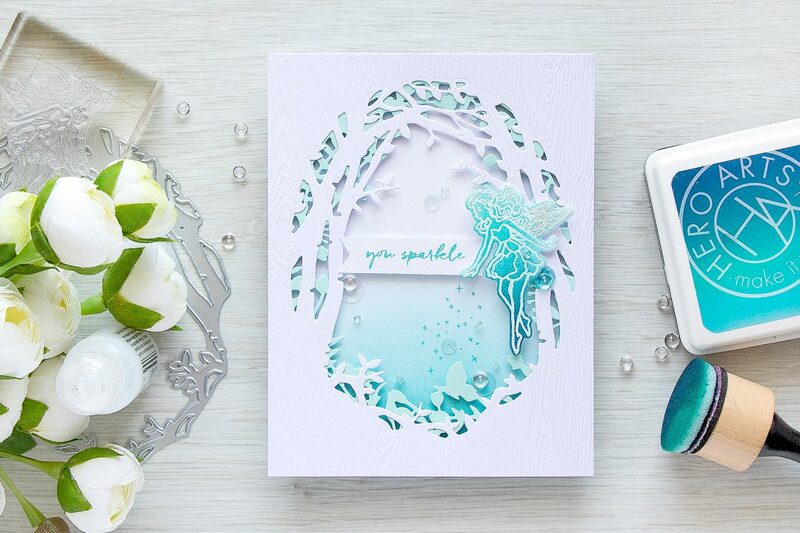 Delicate fairies, forest imagery, fantastic frame dies, timeless quotes – you will find this and a lot more in August kit from Hero Arts. 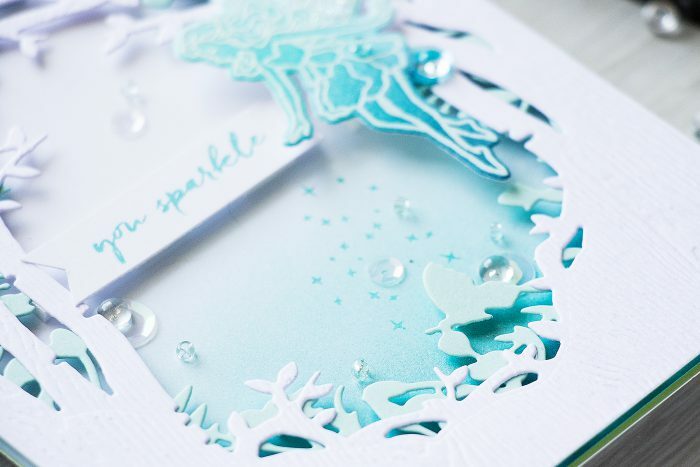 A few words from Hero Arts: This month’s kit was inspired by “A Midsummer Night’s Dream” and features a gorgeous forest fairy theme. There are add-on stamps with Shakespeare quotes. I started working on this card by die cutting two frame images (one from the main kit and another from an add-on) out of smooth blue and white woodgrain cardstock. I guess I shouldn’t be saying “frames” as I actually did not use the outer die that cuts the oval out and turns these designs into frames, instead I only used inner dies to create windows in my panels. I used glue and adhered both die cut panels together keeping the woodgrain one on the top (I just adore this type of paper and I’m very happy to see it included in the kit). I didn’t want to do any coloring for this card, yet I wanted to add color to the fairy. 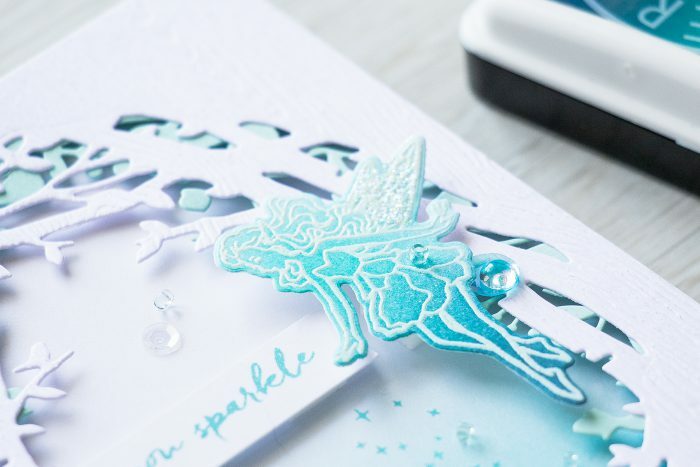 I heat embossed one of the fairy images in white embossing powder onto a piece of white cardstock and blended 3 colors of ink from the Pool to Navy ombre ink pad. There are dies included in the kit to help you die cut the fairies out so I used a matching die and cut mine out in my die cutting machine. I created an A2 top folding card base and blended a bit of ink onto the bottom part of the front panel, I used the same ink I used for the fairy. Next I foam mounted my two die cut panels that were glued together and also foam mounted the fairy, although I used a double layer of foam adhesive to pop her up on this card. 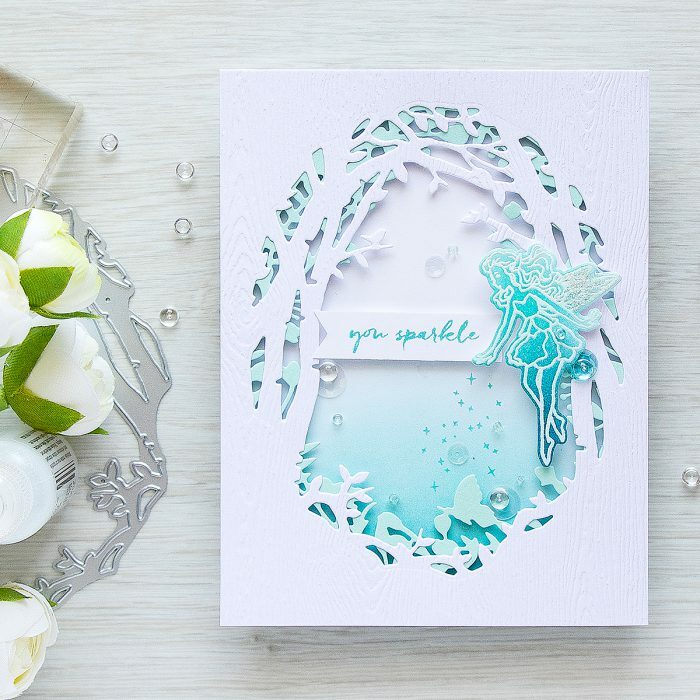 I wanted a very simple sentiment (although there are some fantastic quotes included in the add-on stamp set), so I stamped “You Sparkle” in Pool ink onto a piece of white cardstock and also foam mounted it onto the card. To embellish this project I used sequins and tiny beads from my stash as well as clear droplets from the kit. The fairy wings were decorated with clear stickles for a pop of glittery goodness. The kit contains: A 4×6 clear stamp set; Three matching Frame Cuts dies; An oval border with frame Fancy Die set; Pretty Pink Posh Droplets; Ranger Star Dust Stickles; Three ink cubes in Bubble Gum, Orchid and Green Apple; Woodgrain Cardstock and Vellum; Other gems and cardstock. The kit value is over $50, and Hero Arts is selling this one for $34.99. I love your card! You are so talented! Thank you for sharing with us! 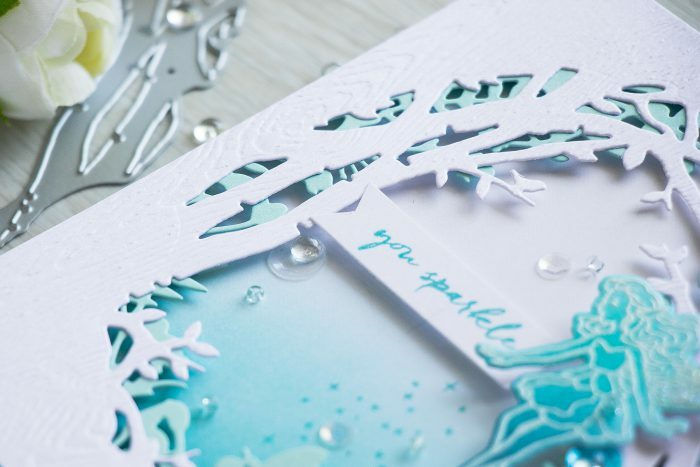 Lovely card, the layers are wonderful! Ah! This looks FABULOUS! It is so delicate and elegant! Yana, I really LOVE your beautiful card. This kit is amazing! Beautiful card. The colour combination is so gorgeous. Another fabulous creation, Yana!! Simply ethereal and so inspiring!!! Love it!!! Such a lovely card! Thanks for sharing your talent. I love how you used the frame from the kit and the add-on frame together. I never would have thought of using both, but it makes a great effect. This is stunning! I like the layered frame dies and the colors! It has a very nice look, being cut out of woodgrain paper.